Description: These Lucite Ice Buckets are perfect for any occasion. Made from a durable clear lucite to withstand many, many uses. The price includes a personalized inserts. 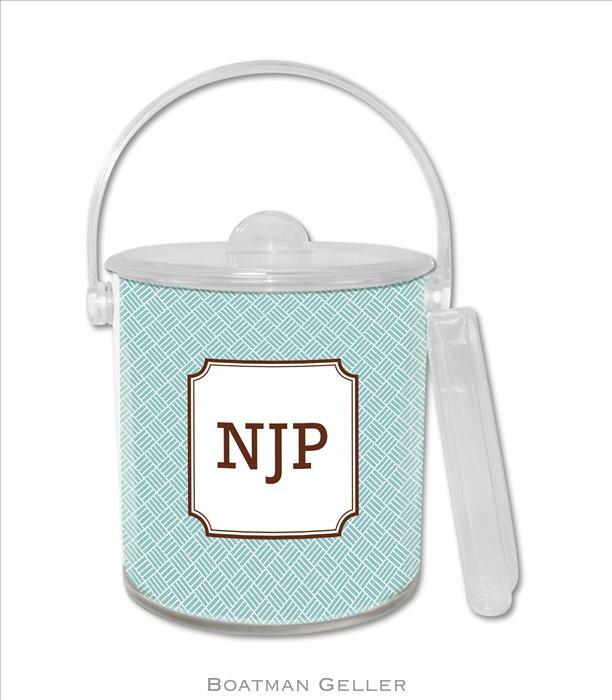 Choose a font or monogram and you've got a one-of-a-kind bucket! It measures 6.75" x 6" x 7" with a double wall and matching tongs. Add matching or coordinating beverage napkins or coasters for a wonderful gift for anyone who loves to entertain! The wonderful thing about this design is you can completely customize it. Use the design you see, but change the color to any of 24 colors (jungle, raspberry, navy, cornflower, cherry, midnight, teal, sunflower, kelly, mocha, petal, lime, chocolate, tangerine, pine, slae, cranberry, butter, lilac, plum, melon, gray, turquoise or bubblegum). Then choose the name plate of a solid or open pattern (square, circle, rectangle...). Choose a font or monogram and you've got a one-of-a-kind, personalized product!